May Day in LA was another success! 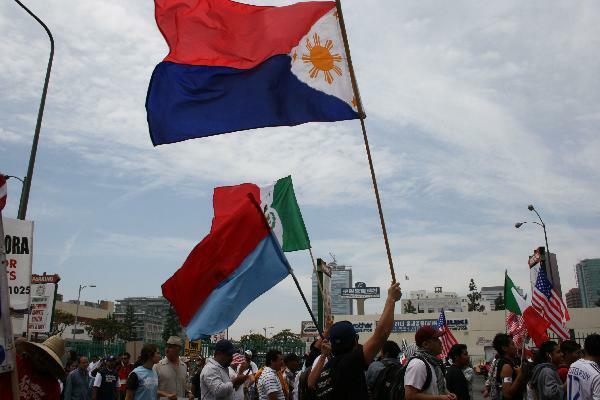 Again, 10,000 workers and immigrants of all nationalities led by the May Day Coalition in Los Angeles marched along the downtown LA in unity against oppressive capital and the 1% that kept them exploited and oppressed through the years. Despite the troubled winds, besides all the other marches, the workers movement remained united. This is the second year that the workers marched under one banner. All despite the machinations of other groups to divide and disperse the movement. May Day in LA was another success! Again, 10,000 workers and immigrants of all nationalities led by the May Day Coalition in Los Angeles marched along the downtown LA in unity against oppressive capital and the 1% that kept them exploited and oppressed through the years. Despite the troubled winds, besides all the other marches, the workers movement remained united. This is the second year that the workers marched under one banner. All despite the machinations of other groups to divide and disperse the movement. The May Day Coalition led the LA march. It militantly demonstrated maturity and force by demanding legalization and fighting back. During the 2006 immigrant rights upsurge, when the ruling class forbid the flying of national flags to demonstrate chauvinist adherence to the war against the Iraqi people and other nations, workers of different nationalities proudly flew their flags in unity and struggle. The Alliance is proud to march with all oppressed workers of all nationalities in multi-ethnic Los Angeles on May Day. We are together with the progressive forces that are fighting back against budget cuts, austerity measures and anti workers measures that balance the budget at the back of the workers, working women, the elderly and the very young. We will fight all the cut backs on wages, pensions and benefits that the ruling class guts to scrimp for their dead capital. May Day is not only a one day festival of joy and resistance in the streets. It is a clarion call for unity and heightened struggle. It is warning for the oppressive and exploitative capitalist system that their end is near.